This is a introductory 12-week course in Buddhism. It provides a comprehensive and detailed understanding of Buddhism based on the earliest sources. This is Buddhism as far as can be discerned as the Buddha taught it and before the development of distinct sects and schools, such as Zen, Tibetan and Theravadin. These courses provide a theoretical understanding as a support for practice. As such, it complements the various practice-oriented activities at the vihara. • Buddhist Life covers the basic values, understandings and practices that constitute a devout Buddhist life in a Buddhist community. This is the Buddhism as it is lived by most Buddhists, that Buddhist children learn, that defines the norms of the Buddhist community. It is primarily grounded in ethics, virtue and harmony. • Buddhist Path covers the course of intensive training that lead to higher spiritual attainments (up to awakening) and that is traditionally undertaken by relatively few Buddhists. It is primarily grounded in human psychology and meditation, but builds on the elements of a Buddhist life. This is a beginning course with no prerequisites. Each week’s class can be taken independently, except that episodes 8, … 11, 12 should be taken in that order and we recommend that the entire sequence be taken in order for best results. The course will be repeated periodically. You may optionally linger until 6:00 or later for Q&A, to supplement the enthralling 4:00-5:30 lecture. This course is offered at no charge since the Dharma is really priceless. Bhikkhu Cintita has written a textbook for this course. Come join us! To register go to https://www.meetup.com/Austin-Words-of-the-Buddha/. Email Bhante Cintita at bhikkhu.cintita. 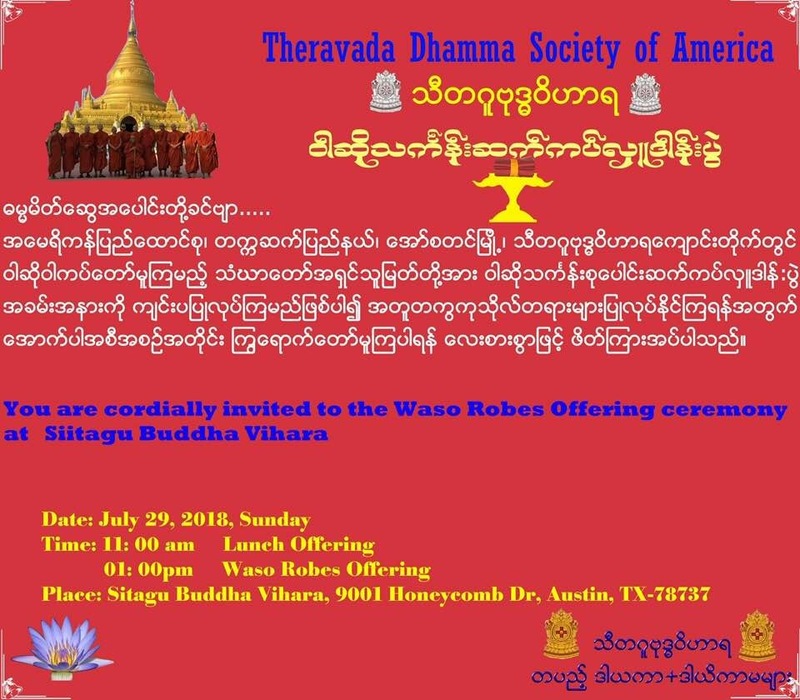 You are warmly invited to following Ceremony : 7 Monks Ordination, 8 Novices Initiation, 4 Nuns Ordination Ceremony on Saturday, June 23, 2018. Chanmyay Sayadawgyi (90 years old – Meditation Master, Myanmar) will be at Vihara on Saturday, June 30, 2018.
on Saturday, June 30, 2018.